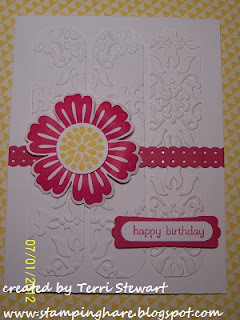 Terri here with today's stamping project. Stampin' Up is giving customers who place a $50 order in July a reason to smile because they can get the exclusive Reason to Smile set set for just $5! This stamp set will not be offered for sale again. I created this card to give to my monthly stamp club members with their orders to show them just one way this stamp set could be used. I hope you like it! Speaking of liking, please visit my blog and leave me a comment about this card. Stamp flower image with Marina Mist ink 3 times; punch out using the 1" square punch. Punch 3 postage punches out of Marina Mist cs. Adhere flower images to the Marina Mist punches. 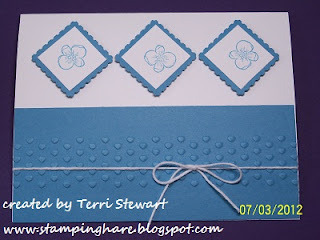 Emboss the 2 1/4" x 5 1/2" piece of Marina Mist using the Adorning Accents embossing folder. Wrap the bakers twine around the embossed Marina Mist cs and tie a bow. Adhere to the white cardbase. 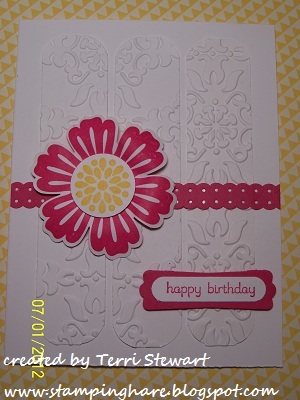 Place dimensionals behind each of the flower squares and adhere to the card front. I'll be attending the Stampin Up convention later this week. 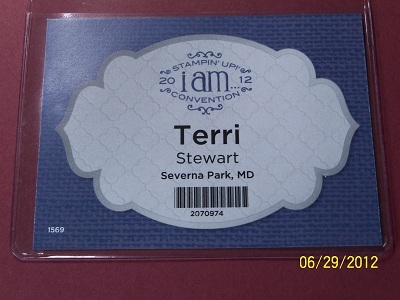 I can't wait to share all of the cool crafty stamping things I'll see while there! Meanwhile, these are the cards I will be swapping while there...recognize the last card from last week's post? Love them all! 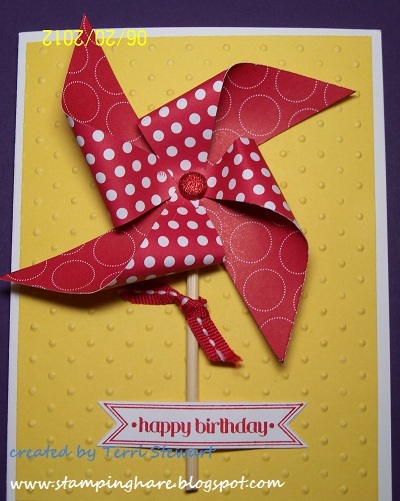 Are you going to make any of these cards at stamp club tonight? Wow - that is beautiful! I also LOVE your swaps and can't wait to find out what you do at the convention! Won't make Stamp club tonite but will see you when you get back! Thanks Terri! 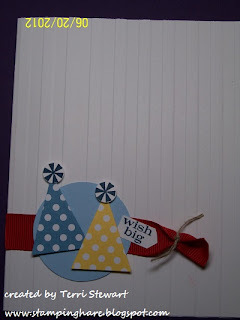 What pretty cards!The embossing is Fantastic!